Best-selling author Tim O’Brien shares wisdom from a life in letters, lessons learned in wartime, and the challenges, humor, and rewards of raising two sons. In 2003, already an older father, National Book Award–winning novelist Tim O’Brien resolved to give his young sons what he wished his own father had given to him—a few scraps of paper signed “Love, Dad.” Maybe a word of advice. Maybe a sentence or two about some long-ago Christmas Eve. Maybe some scattered glimpses of their rapidly aging father, a man they might never really know. For the next fifteen years, the author talked to his sons on paper, as if they were adults, imagining what they might want to hear from a father who was no longer among the living. O’Brien traverses the great variety of human experience and emotion, moving from soccer games to warfare to risqué lullabies, from alcoholism to magic shows to history lessons to bittersweet bedtime stories, but always returning to a father’s soul-saving love for his sons. 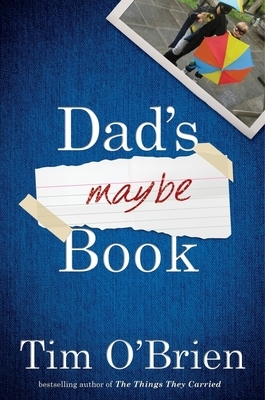 The result is Dad’s Maybe Book, a funny, tender, wise, and enduring literary achievement that will squeeze the reader’s heart with joy and recognition. TIM O’BRIEN received the 1979 National Book Award for Going After Cacciato. Among his other books are The Things They Carried, Pulitzer Finalist and a New York Times Book of the Century, and In the Lake of the Woods, winner of the James Fenimore Cooper Prize. He was awarded the Pritzker Literature Award for lifetime achievement in military writing in 2013.